Arkadelphia High School Badger football fans are just days away from being able to see the 2018 Badgers take the field as Arkadelphia will host Sylvan Hills in the season opener Friday, August 24, at AHS’s AllCare Field at Badger Stadium. Kickoff between the Badgers and Bears is set for 7:00 and will be first of two straight home Friday nights for head coach J.R. Eldridge and his Badgers as they hit the field in defense of their 2017 4A State Championship. With construction on APSD’s new Goza Middle School taking place on the AHS campus, school administration has made parking plans for fans to make the loss of parking spots at the construction site as minimal of a disruption as possible to fans that are attending the game. AHS has worked with school groups and area business and encourages fans to take note of the parking possibilities below in addition to the main stadium parking lot. To assist with opening more spots in the main parking lot AHS football players, band members, cheerleaders and dance team members will be parking on the practice field between Badger Fieldhouse and the APSD Transportation department. - ALTHOUGH BADGER LANE IS CLOSED DURING THE WEEK, IT WILL BE OPEN ON GAME NIGHTS as Nabholz Construction company will open access to Badger Lane from Malone Drive at 5:00 on Friday nights of home football games. Badger Lane will be closed at the end of each game after fans have left the stadium. - THE GRASS LOT BETWEEN THE STADIUM AND WAL-MART will be available for fan parking during the five home football games and other events as needed. Fans should keep in mind that the lot is grass; therefore fans that drive SUVs and trucks are encouraged to take advantage of this area, especially if the area has had rainfall late in the week. Parking attendants will direct fans to enter the lot from Badger Lane by using the concrete ramp that was poured to prevent vehicles from having to jump the curb. -- JROTC cadets will be assisting in all areas. AHS asks in particular that fans that take advantage of the generosity of Patterson Federal Credit Union avoid blocking access and exits to the ATM at their site. Fans are also asked not to block the delivery entrance to Wal-Mart on the back Wal-Mart entrance off of High School Drive. The shuttle will pick up at these locations beginning at 5:30. The shuttles will drop fans off at the four-way stop of High School Road and Badger Lane in front of the high school. Fans will then walk from the four-way stop to the main entrance to the stadium. To catch the shuttle back to your vehicle if you park at one of these locations, the bus will pick up at the same location by the four-way stop. Public address announcements will be made to announce when the shuttle will begin to take fans back to their vehicles from the stadium. In addition to these parking areas, normal parking areas around the high school will be available. 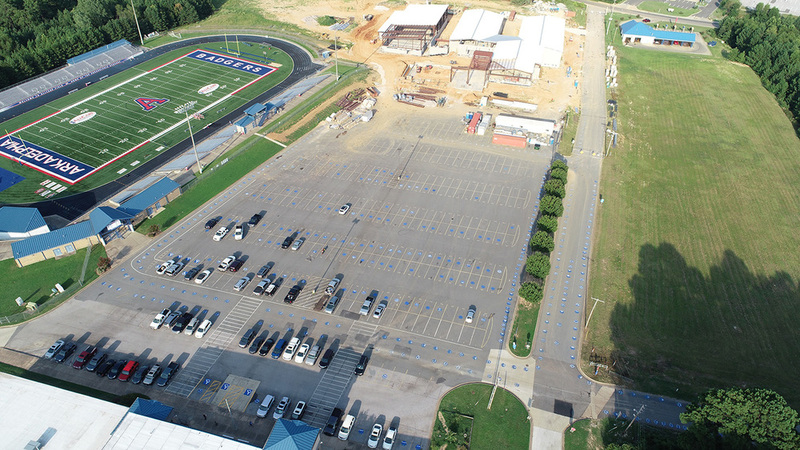 Arkadelphia High School and the Arkadelphia Police Department do ask fans who may try to find alternate parking plans near the high school to be aware of where you may park and not block driveways or other access points to property owners who live or may have a business near AHS.